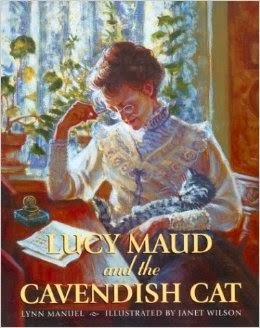 I was first tipped off to the picture book, Lucy Maud and the Cavendish Cat , by Annette. She found it, reviewed it, and I hastily went about procuring a copy for myself. This year I pulled it off the shelf to read aloud to my kids. As fans of Lucy Maud Montgomery know, she was a lover of cats. One of her favorite cats was named Duffy and this cat was loved oh so very dearly. When Montgomery married Ewan Macdonald and moved with him to Ontario, Duffy stayed behind on the Island. Montgomery missed Daffy dreadfully and the time finally came when she was able to send for him to join her in her new home at the Leaksdale Manse. It is quite possible that no other cat in history has been adored as much as Daffy. (At least, it's hard for me to imagine a greater case of love and devotion for a feline!) If you read Montgomery's journals you will see that she absolutely adored her pet and it meant the world to her to have him around again. I suppose it is rather understandable when you think that Daffy represented a home to Montgomery that she missed very much. This picture book tells the story of Montgomery's relationship to Daffy through the eyes of the cat. What would Daffy have thought when watching Montgomery write her books? What would Daffy have thought at being moved from the only home he had ever known? Although this book takes a guess at Daffy's thoughts, the facts related herein are mostly true and the story provides an interesting way of learning more about this famous Canadian author. This is the first year that I'm involving my children in the Lucy Maud Montgomery Reading Challenge (because I've wanted to wait and share her with them when I thought they were most in a position to begin to appreciate her, which I think my oldest is). We read this picture book and then have begun watching the Road to Avonlea series all together in the mornings. I don't know how far we'll get, but it's lots of fun to share my favorite author with my children (FINALLY)! I've been waiting for this, let me tell you! I highly recommend this easy-to-read picture book to you to share with your own kids and young readers. Interesting fact about Daffy: she saved a tuft of his fur when he died and preserved it in her scrapbook. Daffy's fur is now on display at the Lucy Maud Montgomery Museum in New London, Prince Edward Island. Note: I cannot find a link to a LMM Montgomery museum in PEI other than this one ("Ingleside") which says it intends to close. (WEEP. I visited this location - and took a carriage ride around "The Lake of Shining Waters" when I visited. Lovely, lovely place!) Anyone with any additional information about this particular museum mentioned in New London, please share your info in the comment section. We did not visit this one that I recall.